In a unique concept to portray the incidents happened in the specific one hour at various places in an one hour episode, the first episode of 24 (US TV Series) focuses on the incidents happened between 12:00 a.m. – 1:00 a.m. Episode Title : 12:00 a.m. – 1:00 a.m. The first episode (often referred as the pilot episode) is very important one and makers need to pay extra attention towards the same; as it is going to introduce the characters and it have to build a prestige as well. It must have to have the content which is enough to make the viewers waiting eagarly for the rest of the episodes as well. Did the makers of 24 passed this test? There are so many characters we are introduced in the first episode itself. And there are various stuff going on parallel (at different places). But the incidents are weaved interestingly and the viewers are actually found enjoying the process. 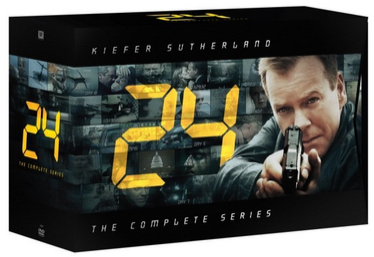 As 24 is a crime thriller / procedural drama, we expect thrilling moments from the same. And seeing some of them in the very first episode is a viewer’s delight. Does the character look “larger than the life”? No, they aren’t. And it works in favor of the TV Serial. Viewers can find concerned parents, typical teenagers, brutal antagonists, thoughtful strategists, game playing politicians, patriot special force officers, glamorous socialites, tricky henchmen (and women), and many more. The postive factor is, the makers are able to make an emotional connection with the viewer by having such characters. For example, take a scene where Kim, after playing chess with her father, slips into her room and after a few minutes her parents found that she ran away. A typical problem that many parents of teenage son/daughter face in countries like US/Canada/UK or even metro cities in India and other countries. And if you take a look at the headquarter of a senator, you see a lot of things going on there, including but not limited to political mind games, conspiracy, idealism and much more. It also explores a very important fact, that most of the countrymen often doesn’t pay much attention to. The people of special armed forces and security agencies are ready to take on any situations in short (or even without a) notice! Of course, there are corrupt fellows there as well. But, the actual patriots are also working there, who see nothing else, but the protection of motherland and fellow citizens. They can even put aside their personal and family interest and works for the greater good. Kudos to them! The makers paid attention to smaller things. See that when special agent Jack was called to CTU, he was having a leisure time at his home. And he went office in those cloths only. When needed he changes into better cloths at office only. It happens that way only. There are only few Hindi melodramas where you see the characters wear make-up while sleeping also. The outdoor locations are chosen and explored intelligently. For example, take the introductory scene of the serial where you see Victor is in Kuala Lumpur. In a very small scene also, you will see the famous Petronas Towers! Some practical decisions the people of special forces are bound to take, which is also explored nicely in the episode. Take an example of the scene where despite of having personal feelings in past, Jack keeps Nina out of the loop, when he was informed that there is a mole in CTU. The character of Alan is introduced intelligently. He have to do nothing much in this episode, but it may bring some surprises in the future episode. The end of the episode is very dramatic. You will definitely like the scene where the cars (in one Kim and Janet are there; and in the other, Alan and Teri are there). The background music is a positive attribute of this episode and it adds to the thrill. The dialogs are thoughtful and delivered even more efficiently. The script writers did really hard work and it is evident on the screen. In terms of acting, actually none of them disappoints. Of course, the episode is more focused on some principal characters, and it is Jack Bauer show, it doesn’t mean the other characters are sidelined or not given enough footage, or played by little less able actors. On the contrary, the beauty is, each actor tries doing his/her job with honest efforts and succeed in wooing the audience. The DVD quality is good, and it makes a good audio visual experience in home theatre as well. Let us take a brief look at the content of the episode (We will try not to include any spoilers). The following takes place between midnight and 1:00am, on the day of the California Presidential Primary. Victor Rovner, connects to CTU (Counter Terrorist Unit – Los Angeles) and start transferring an important file to one agent(who? well, its suspense) there! Richard Walsh, the director of CTU was informed that Rovner found very important information about an assassination attempt. The target is Senator David Palmer (who, we will see that is running for US President election and considers as a worthy candidate). Jack Bauer, the special agent in charge (the protagonist) is having a leisure time at his home. He is trying to give the time needed to his daughter Kim who is in her teens and his wife Teri. After a while they found that Kim escaped away from home! They decide to go to the root of the problem. But, at the same time, Jack is called from CTU. Nina Myers, CTU’s Chief of Staff, is calling to tell Jack that Richard Walsh has called an emergency briefing. Jack had to leave for the office, as he suspects around 1 hour at office, he asks her wife to call Kim’s friends and find her trace, till then he will be back! Kim met her friend Janet in the car and they meet two Guys Dan Mounts and Rick Allen. We are also introduced to two other main characters at CTU, Jamey Farrell and Tony Almeida. And Alan, Janet’s father is also an important character. You gotta keep a watch on him. A little pricey, but a TV serial which is definitely going to give a good experience, if you are a thriller lover. Worth going for.